Here are some facts about Durham Castle. Durham Castle was built in the 11th century. It is located on a hill overlooking the River Wear in the city of Durham in the north of England. The castle was founded by William the Conqueror soon after his victory in the Battle of Hastings. For several centuries, it was the home of the Prince Bishops of Durham. Durham Castle and Durham Cathedral were constructed in just 40 years, which was fast for the time. The castle originally housed the bones of St. Cuthbert, a local evangelist. 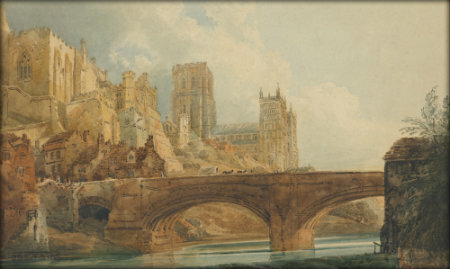 The castle was given to Durham University in 1832. Today, over 100 students still live there and eat their meals in the castle’s Great Hall. During summer, when the students are gone, Durham Castle serves as a hotel. The Norman Chapel is the oldest part of the building, and features carvings of animals and a mermaid. During World War 2 the chapel was used by the Air Force as an observation post. The other chapel in the castle is Tunstall’s Chapel, named after its builder. It has a modern stained glass window, replacing the original one which was smashed by a runaway lawnmower. One of the highlights of Durham Castle is the Black Staircase, named because it was made from dark oak wood. It is almost 60 feet high. Palace Green is the open area that separates the castle from the Durham Cathedral. Originally full of wooden houses, this area is supposedly haunted by a small boy who was pushed off a balcony. The centuries old cathedral still holds daily services, attended by locals and tourists. The cathedral is also home to the Durham Cathedral Choir. What next? Discover more castle facts by visiting our castles resources page, or learn all about The Normans.